In a European-wide study, led by the University of Glasgow MRC/CSO Social & Public Health Sciences Unit and published today in Social Science & Medicine, scientists found links between urban design and levels of inequality in life satisfaction. The study looked at 66 cities across Europe and found that life satisfaction of their residents varied a great deal. 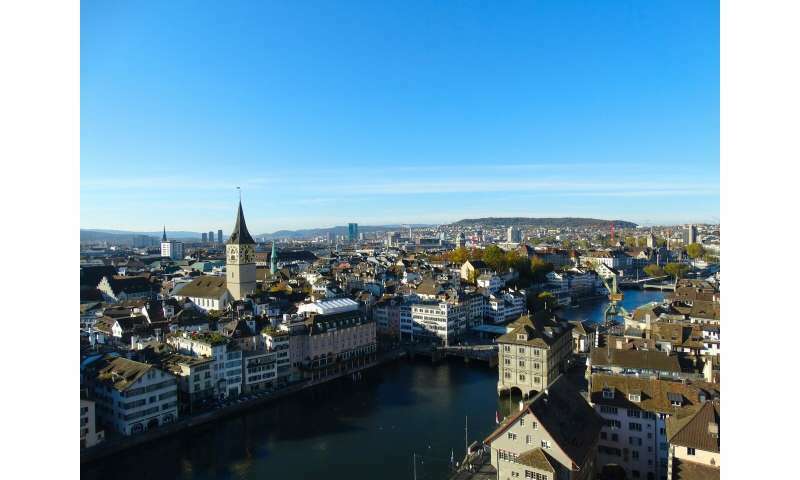 Residents of Zurich reported the most satisfaction and the residents of Athens the least. The study looked at the city environment, including how much green space the city had, how much of the city was tarmacked and how much dense housing there was. Cities with an even distribution of facilities, housing and green space were linked with lower levels of inequality between residents' life satisfaction levels, suggesting that more equal access to a range of facilities and types of land may help reduce the gap in life satisfaction between the most economically-deprived and most affluent residents of a city. The study also found that there was a strong link between higher life satisfaction and living in cities with homes surrounded by natural green space. However, lower life satisfaction was linked to living in cities that had more wasteland, more space dedicated to housing, and more space in which all the land is concrete or tarmacked. More than half (54 percent) of the world's population now lives in urban areas, and this is expected to rise to two thirds (66 percent) by 2050 according to the United Nations. Understanding the influence city environment has on all aspects of health and wellbeing is increasingly important. Life satisfaction is increasingly seen as an important component of population health and wellbeing, and one which governments and policy makers are trying to maximise and equalise. This is the first study to consider how urban landscape affects inequalities in life satisfaction, and not just life satisfaction itself. Dr. Jonathan Olsen said: "The findings of our study suggest that urban planning has a large role to play in addressing inequalities in cities. "Until now there has been a strong focus on green space and housing density, but from this research we can see that this is not the whole picture. Urban environments are complex, with a huge range in types of space and function; they are not simply either green or grey, or more or less densely settled. Our cities are continuously evolving and there is ample opportunity to ensure these are healthier and happier place to live"
Co-author Professor Rich Mitchell, added: "What people want or need from their city varies moment to moment, day to day, life stage to life stage. If a city is varied enough to offer people what they need, when they need it, it is likely to support a higher quality of life." The study, 'Are urban landscapes associated with reported life satisfaction and inequalities in life satisfaction at the city level? A cross-sectional study of 66 European Cities' is published in Social Science & Medicine.